Always place a Campania fountain on a solid level surface and not directly on grass, soil, or an uneven surface. Proper winter care is recommended for all Campania fountains for protection in environments with potential freeze-thaw cycles. Drain fountain and make sure that the basin(s) are completely dry. If possible, remove pumps, rubber stoppers, drainpipes, finials, and other small components for storage indoors. Note that stoppers or drainpipes are removed to allow drainage in the event water accumulates in any basin. Compression stoppers may be left on the pump cord for easier assembly next season. 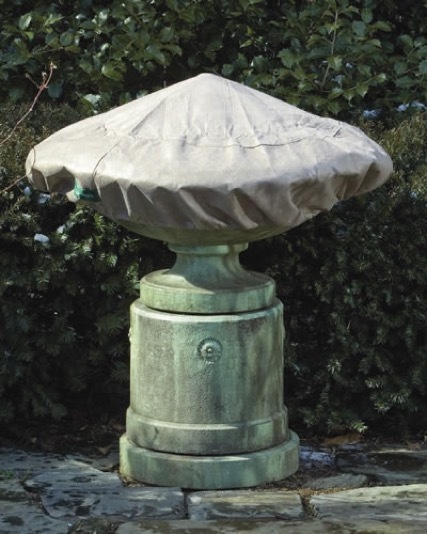 Cover fountain with an appropriately sized fountain cover, available from Campania, making sure that water will not accumulate in the basin or other fountain components and freeze. Check fountain periodically to ensure that cover is secure and water is not accumulating in any fountain component. Pests and Disease to Watch for….